After four weeks of wind, sunshine and rain, phase one drew to a close this week in the Victoria Park Community Cricket League. Masiha opted to bat against unbeaten Friends on Monday with opener Stu Miller (50) looking in fearless form as they posted a solid 132-4. Friends’ reply was full throttle, racing to victory inside 12 overs thanks to some dazzling all-round form from Naveed Muhammad (40 runs and 2-2). Camel Lights had a great start on pitch 3 before suffering a late flourish of wickets, also posting 132-5 - Rich Hagen top scoring with 43. In a tense finish Millwall chased down their target with just a ball to spare, thanks to some great striking from Sumon Miah (41). On pitch 2, Sky looked ruthless against Mile End Tailenders, posting 172-4; opener Haris Soomro got them off to a fantastic start before some great hitting from Aleem Hussain (50) helped them to their imposing total. In reply the Tailenders finished on a credible 129-3 thanks to some last gasp hitting from Sanj Guewardene (59). Tuesday saw tight group F come to completion, with the winners qualifying for Division One; it was a tense feeling on pitches 1 and 2. Despite losing Will Issac for a diamond duck, London Fields saw off Victoria Lounge by 41 runs, Paul Teasdale (51) and Troy Utz (36) starring for London Fields, whilst Bansko Bears edged past Broadway Market by just five runs thanks to half centuries by Will Arnold and Andrew Butel, both teams qualifying for Division 1. Mad Marroccas (149) defeated Pacific (133-6) by 16 runs on pitch 3 despite a brilliant 66 from Paul Raujkumar. 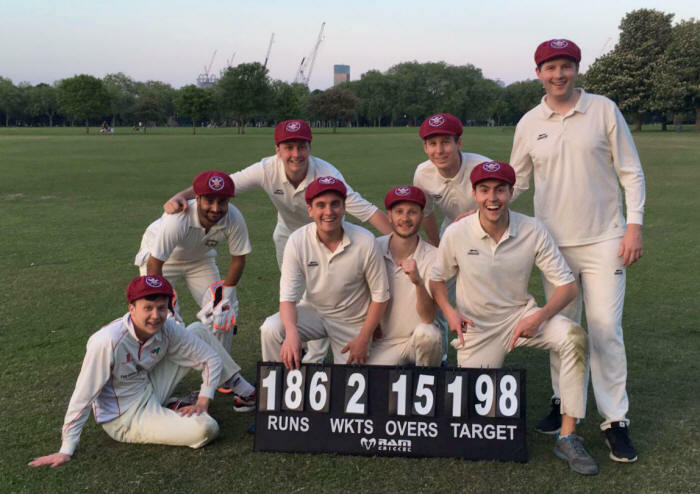 After two defeats on the bounce, Ex-Pats produced a stunning batting display against Homerton on Wednesday. Trent Byrne was the man in form, striking a big 50 and great bowling at the death. He was supported by Alex Hickson, who continued his purple patch with a second half century in two games as Ex-Pats finished on a whopping 194-0. Homerton chased admirably, James Everdale (50) and Hyde (49) keeping them in the match, but with late wickets they fell to 186-5, just 8 runs short. London Tigers produced a second big score of the day, striking 193-5 with both R. Khan and M. Noor retiring on half centuries. Old Fallopians put up a spirited response but fell 71 runs short on 122. Old Fallopians 2nd VIII fared better on pitch 3 (147-5), defeating Crossrail (124-7) by 23 runs. Thursday saw undefeated Stokey Scoundrels and Rose & Crown meet in group A. Scoundrels put up a competitive total with unbeaten half centuries by Rizwan Siddiqui (50) and Sarafat Ali – the latter returned to the crease to hit the highest score of the season so far with 68, making it three out of three unbeaten half centuries. However, anchored by in-form Joe Fisher (50), Rose & Crown kept up with the run rate required and got home with 7 balls to spare.